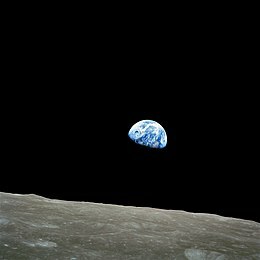 ↑ Apollo 8 Press Kit (PDF) 33–34။ NASA (December 15, 1968)။ June 28, 2013 တွင် ပြန်စစ်ပြီး။ – The spacecraft mass at launch includes the CM and SM, but excludes the ၄,၀၀၀ ကီလိုဂရမ် (၈,၉၀၀ ပေါင်) Launch Escape System (LES), which was discarded before reaching Earth orbit. 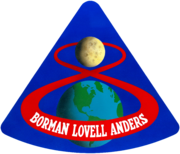 ↑ Apollo 8 Mission Report (PDF)။ NASA (February 1969)။ June 28, 2013 တွင် ပြန်စစ်ပြီး။ – The mass for LTA-B was less than that of a flying LM, because it was essentially a boilerplate decent stage. 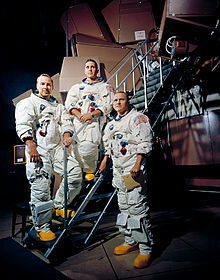 A fully loaded, flight-ready LM, like the Eagle from Apollo 11, had a mass of ၁၅,၀၉၅ ကီလိုဂရမ် (၃၃,၂၇၈ ပေါင်), including propellants.